For your one and only face. This is Kristina Holey x Marie Veronique. You know Marie Veronique as the formulator behind the eponymous, effective, clean skincare line based in Berkeley. I’m an absolute believer in her line and constantly recommend it to those looking for sophisticated, effective, science-backed facial skincare creations. You may or may not know Kristina Holey, one of the most sought-after facialists who splits time between the coasts (and, um, who is always invited to visit Kansas City, please and thank you) and takes care of your complexion from the inside out. When these two skincare-obsessed, beautiful geek girls combine their powers, the result is just that: Results. Marie and Kristina took a functional, results-oriented, no-frills approach to this collection, keeping essential oils and fragrance out and keeping time-tested, skin-nourishing ingredients in. The beauty of this approach is two-fold. One, if you’re sensitive to EOs and fragrance, you’re in the clear (though this doesn’t account for any other random allergies). Two, if you do enjoy aromatherapeutic effects and know what works for your skin, this collection is highly blendable with your favorite facial oils. At the end of 2016, I introduced each of these new serums one-by-one into my skincare routine. I switched out my then-current hydrating gel moisturizer for Soothing B3 Serum and added in each additional serum after a week of zero reactions or skin issues. After about six weeks of testing the entire line, I’ve developed some addictions and excitement around how these products can live in my future-perfect, customized, never-experimenting-again-routine. This is my favorite product from the collection. Barrier Restore Serum establishes something of a new product category for me. It’s a serum that’s made to be applied as the very last step in your routine (unless you’re also using an oil), promising healthy-looking, touchable skin that’s plumped and radiant. That describes my experience — and then some — when using Barrier Restore Serum. When layered or mixed with daytime creams, cushiony gels and more, Barrier Restore added that extra little bit of “ooomph” to make my parched, dehydrated, flaking and confused skin look and feel better. As stated on the Marie Veronique website, collaborator Kristina Hole intended for Barrier Restore Serum to be used on clients with weakened barrier layers. Think those who over-exfoliate, under-hydrate or otherwise have skin that’s prone to discomfort. Without adding bulk to a full and detailed skincare routine, Barrier Restore Serum provides the much-desired ceramides, sodium hyaluronate and sodium PCA (lipids and humectants, basically) that keep skin feeling hydrated, protected and bouncy. 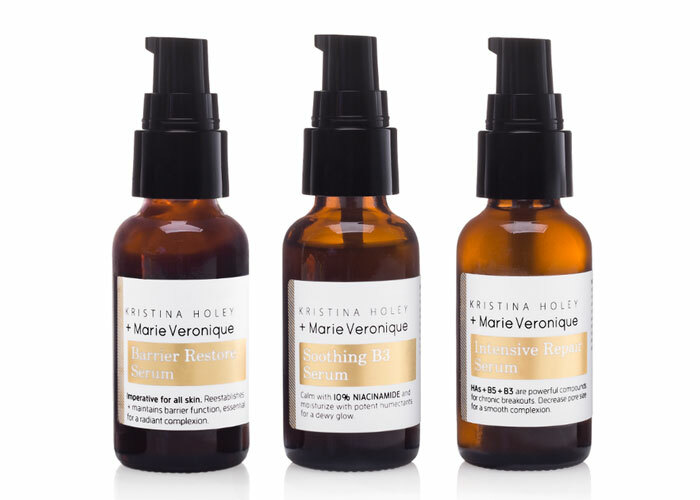 If you can only splurge on one product from the Kristina Holey x Marie Veronique Collection, make it Barrier Restore. You’ll use it morning and night, and you will absolutely see a difference in your skin. A gel moisturizer after my dehydrated heart, Soothing B3 Serum delivers legit hydration; a lightweight, layerable texture; and the perfect base for mixing and matching with your other creams and oils. But beyond its blendability, Soothing B3 Serum presents a more sophisticated ingredient deck compared to many gel moisturizers. For example, it combines sodium hyaluronate (a derivative of hyaluronic acid, the king of skin hydration) with other hydrating ingredients such as panthenol and 10 percent niacinamide (vitamin B3), which is known for its ability to calm fussy skin. I felt these effects during my testing and absolutely loved how little product I had to use to achieve a very hydrated, comfortable texture in my skin. While Barrier Restore Serum is my No. 1 pick from the collection, Soothing B3 Serum is one I’ll be watching as I continue to test gel-based moisturizers. Honestly, it was difficult to conclude testing of this serum after six weeks because I really, really, really liked the way it made my skin look and feel, whether it be a dewy glow under light makeup or, gasp, for times when I wanted to go makeup-free and show off the great condition of my skin. If you can choose two from this line, get this one as well. Addresses stubborn breakouts, very common to adult onset acne. Rebalances oil production, reduces inflammation, gently clears congestion without irritation or drying the skin. I wanted to love Intensive Repair Serum — and I’m willing to give it another shot in an exclusive Marie Veronique-only skincare routine — but during my testing, it was just OK.
To be blunt, while my acne issues were a little more under control during my testing period (wish I could say that about right now), I wanted to see how well Intensive Repair Serum could clear my remaining congestion. I’m prone to heavy congestion on my chin, nose and jawline. Regular use of acid toners (P50 for the win!) has helped a lot, but as I took a break from that beloved acid and switched to Intensive Repair Serum (on the advice of Kristina and Marie), I feel like my skin creeped back into minor congestion and I didn’t get the full benefits of Intensive Repair Serum. To attempt to remedy the issue, I alternated between using Intensive Repair Serum and P50, and while this helped re-clear my skin a bit, I’m just too smitten with P50 and its results to be able to say I’d absolutely give it up in favor of Intensive Repair Serum. What’s funny, of course, is both Intensive Repair Serum and P50 have a very similar, vinegary scent and use some of the same ingredients (namely lactic and salicylic acids, plus vinegar). If P50 is too strong for you, or you want to experiment a bit with acids in a streamlined routine, try Intensive Repair Serum. I’ll be giving it another shot in the customized routine outlined below and will report back. But, what’s great about Intensive Repair Serum is that even if I’m still just not feeling it as an overnight treatment, it doubles as a 20-minute mask for some instant brightening and exfoliating. If you’re skin is similar to mine — combination / oily but dehydrated during winter and transition weather, consider this somewhat customized routine, created by Marie Veronique and Kristina Holey, for your skincare needs. Obviously, you will need to evaluate each product for yourself, but here’s an idea of how these new products can work in a Marie Veronique-style skincare routine! Cleanse with water. Alternate with warm and cold, then dry with a muslin cloth. Apply a thin layer of Soothing B3 Serum, massaging it into skin. Apply a thin layer of CE Ferulic Serum, massaging it into skin. Apply a thin layer of Barrier Restore Serum, massaging it into skin. Finish with Everyday Coverage SPF 30. During winter, or when your skin is feeling dry, you may apply a few drops of the Treatment Oil. Apply a few drops into your palm, warm it in your hands and massage into skin. Cleanse with Replenishing Oil Cleanser. Take a few minutes to do this. Start by running your hands under warm water. Keeping them moist, take 1-2 pumps of the cleansing oil into your palms and begin massaging it onto your entire face. Using the first three fingers of each hand, draw tiny circles, covering each section of the face. For the eye contour area, use just the middle finger. Begin at the inner, upper eyelid area and move outward and down, finishing at the inner bottom corner of the eye. Repeat 3-5 times or until eye makeup has dissolved. Mist with Pre+Probiotic Mist, either directly onto skin or swipe with cotton pad. Apply a thin layer of Gentle Retinol Serum. Apply a thin layer of Soothing B3 Serum and Barrier Restore Serum. Apply a few drops of Treatment Oil. Apply a thin layer of Intensive Repair Serum. This will help exfoliate and clear congested pores. It works well with retinol, as it aids in deeper delivery. Finish with Barrier Restore Serum and Treatment Oil. What are your skincare concerns? Have you tried anything from Marie Veronique? What, if anything, stands out to you from this special collaboration? Tell me in the comments section!